Let's start things off with an out-of-context screencap! 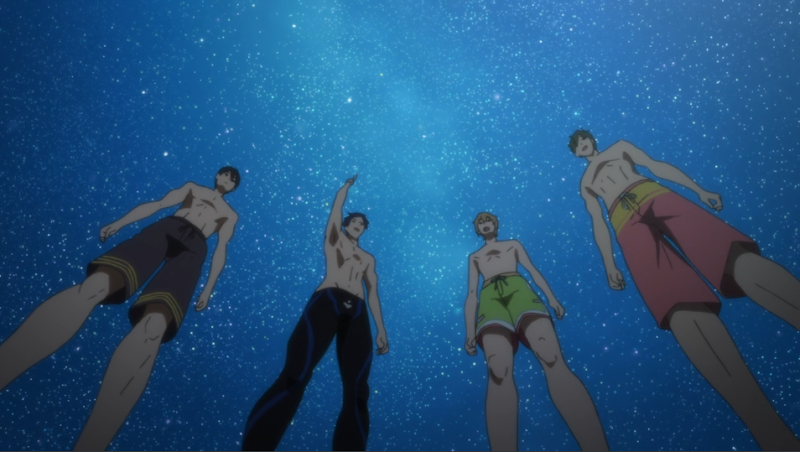 The cliffhanger gets wrapped up pretty easily within the first third of the episode, but unfortunately I was right in thinking that Makoto was the one we really needed to be worried about. Freezing up in fear is just as bad as not being able to swim, as this episode shows. I would trot out my "CPR is not a kiss" speech, except that little tease was clearly there for fanbait purposes. Also, I think I used up all my soapbox points with my rant last week about the dangers of swimming alone. What I found more interesting in that scene (aside from the dramatic push of "is Makoto going to be okay") was that this was the first time we saw Haru lose his cool. I mentioned this in my coverage of the first episode, but Haru's characterization so far is very similar to Oreki from Hyouka. 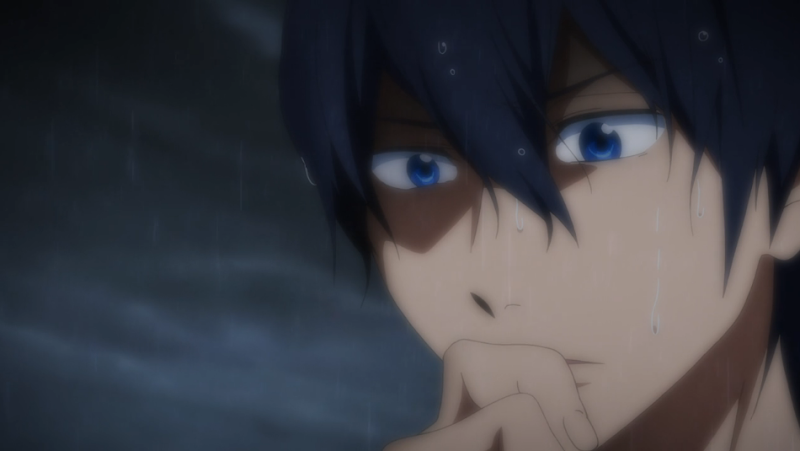 Of course, the big exception here is that there is one obvious thing Haru really cares about: water. However, in last week's episode and to a large extent in this one, we see him be protective of Makoto, going after him first in the ocean rescue and then later telling Nagisa and Rei to back off when they ask him why he's afraid of the ocean. Haru's friends mean a lot to him, but it seems to take extreme circumstances to drag out that part of his personality. 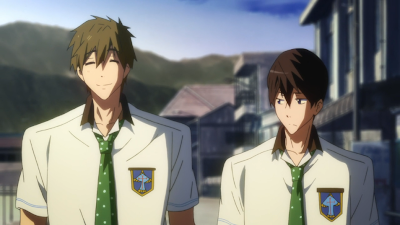 Last week's episode: Makoto fakes a neutral conversation while they walk by the ocean. Haru is looking at his friend, not the water, because he knows something is up. Let's unpack this a little further. There is absolutely no denying Haru's obsession with water at this point. This is the guy who tried to climb into an aquarium at the store. Because of this, it's a bit hard to believe that he'd give up any opportunity to swim, even though he's not completely invested in the competitive side of it. So why did he give it up? Because it made Rin sad. 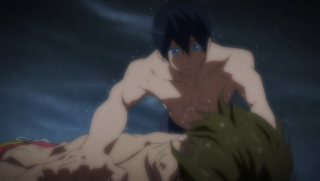 So here's my argument: as much as Haru literally loves water, he cares about his friends more. His obsession doesn't blind him to what's going on with them, despite how it may look. I don't know if they'll play with this in later episodes, but I thought that it was a nice touch to the episode. 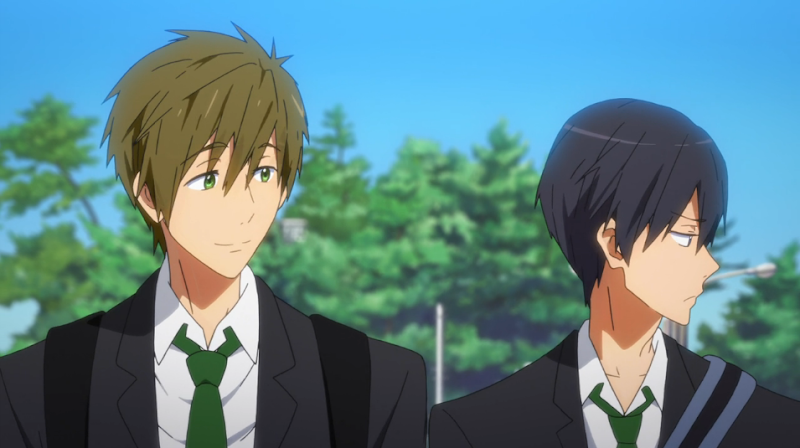 And there's poor, sweet Makoto. I still don't get why his animal representation is a killer whale, since that doesn't seem to suit him at all. Anyway, the riddle I posed last week has been solved, and the answer is an old fisherman drowning at sea. This was a pretty good explanation for his fear, since judging by his age, that was likely Makoto's first experience with death. On top of that, having it happen in such a tragic way would be traumatizing no matter what age you are. In the way he explains it, it's obvious that it's something that he's continued to carry with him as well--"We swim three kilometers every day," as well as the fact that he continues to change the flowers for the fish's grave. Honestly, I don't think he does that just for the fish. 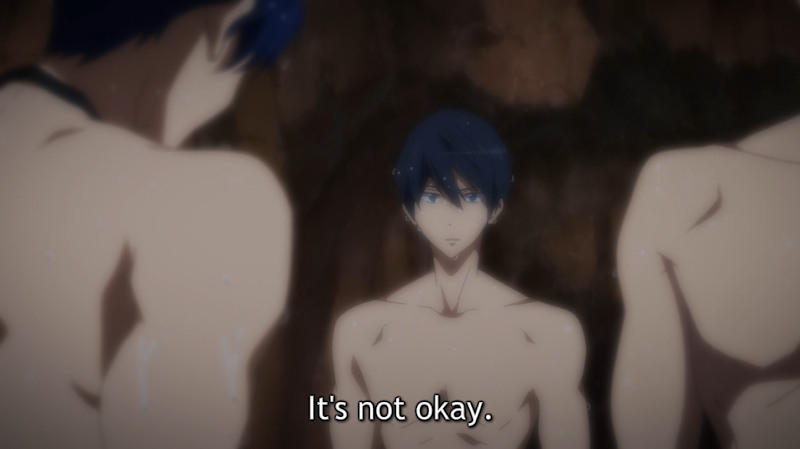 But, like Haru, he's willing to set his fear aside if it means making his friends happy. 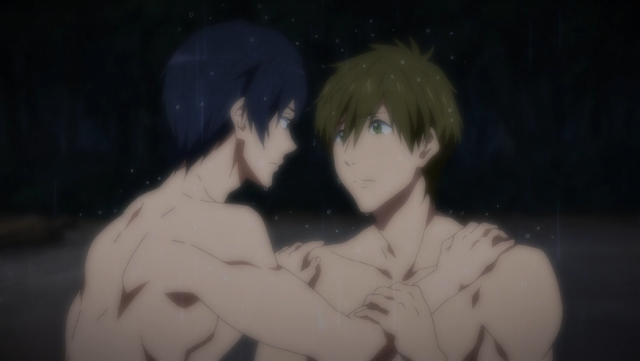 As we saw in this episode, that kind of selflessness can backfire, but in the larger picture I think that it means Makoto is finally making peace with that part of his past. He'll likely be more honest with Rei and Nagisa from now on as well. 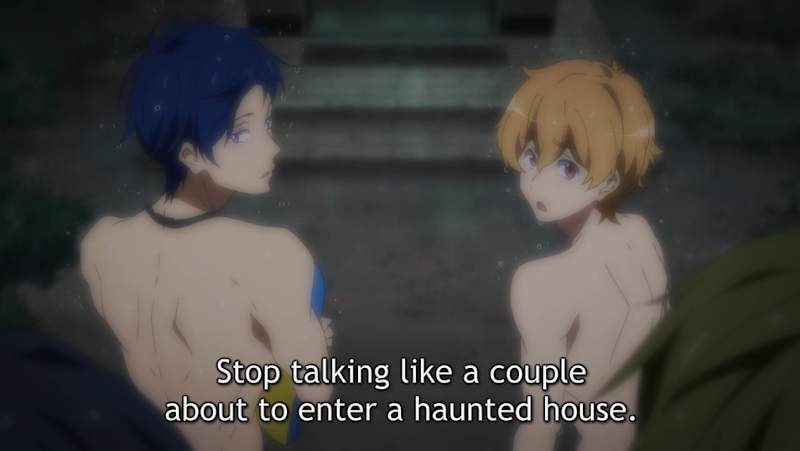 Speaking of which, I still don't understand why this was something that Rin was aware of when Nagisa didn't know about it. Didn't Rin leave before Nagisa? Or do I have my timeline messed up somewhere? It's possible that Haru told him about it, but considering how defensive he was of Makoto's feelings in this episode, it doesn't seem likely. Maybe I'm over-thinking it. Anyway, onto the rest of the episode! 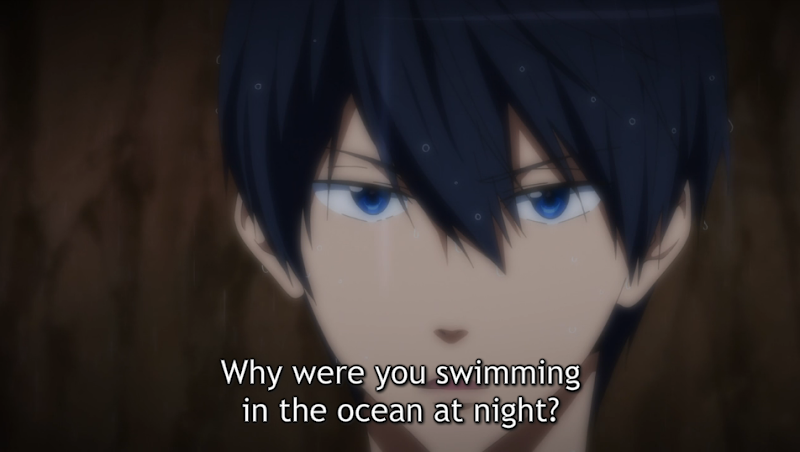 The fallout from Rei's descision to swim alone in the ocean at night did not go as expected; in fact, it was downplayed a bit. That probably did a lot to calm down the fangirls who were convinced that characters were going to die last week, but as I previously went off on a tangent about, this is a serious issue. While I was glad to see that Rei was immediately remorseful, I was a bit concerned that the show could brush off Makoto almost drowning so easily. Also, Nagisa should've listened to Haru and gone for help; if something bad happened to all of them, then who would know? However, being a light-hearted anime seems to have saved everyone's skin, but I still think someone should hang a giant neon sign over those scenes reading DO NOT DO THIS. 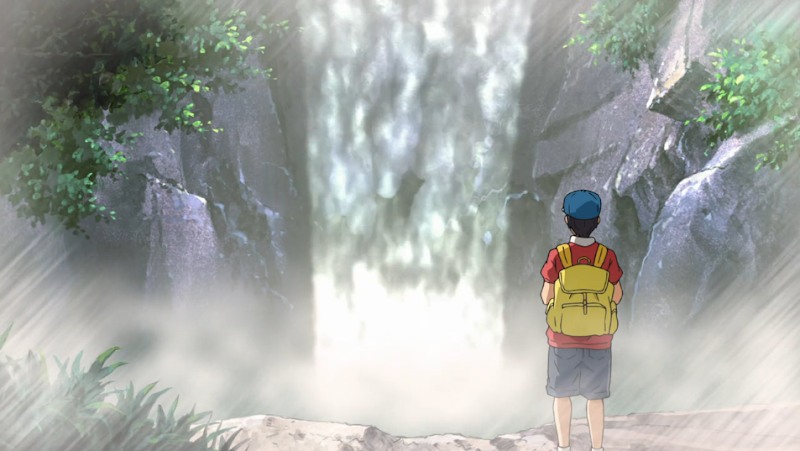 The rest of the scenes get back to what I typically expect from this show, with Nagisa trolling Rei (for refrige-"rei"-tor, Nagisa earns the title King of Puns), nakkid aprons for everybody, and a story about Haru's romantic encounter with a waterfall. And it looks like that's it for the "training" arc, since we've reached the halfway point (time sure flies!) and from the preview it looks like the club will participate in their first real competition next week. I'm pretty sure that this is some sort of preliminary thing, given the episode count, but it'll be a good indicator for how much our heroes may or may not have improved. 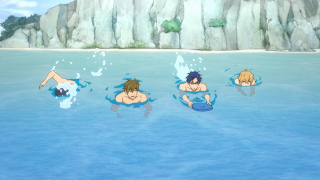 It'll also be nice to see the detailed swimming animation again, since the show has been skimping on that lately. In the meantime, I'm just happy everybody's okay. 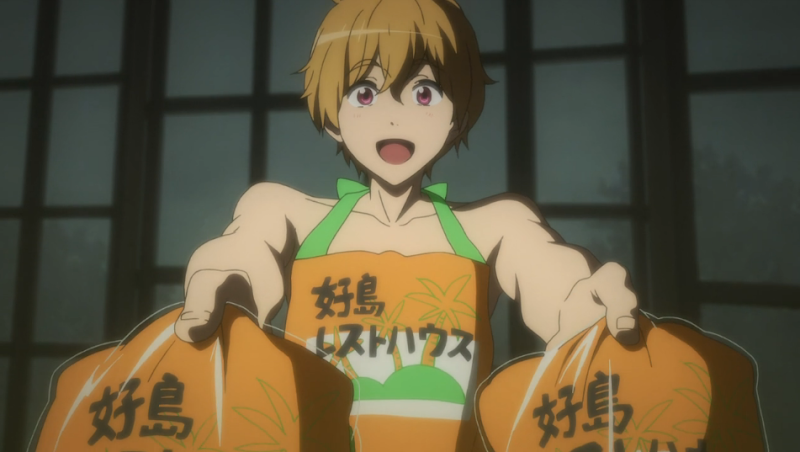 "And there's poor, sweet Makoto. I still don't get why his animal representation is a killer whale, since that doesn't seem to suit him at all." Totally agree, I was ranting to a friend that in my mind, Makoto was a turtle, rather easy-going, Nagisa is a seal, really playful, and then I was still unsure for Rei but kept thinking of him as a fish (ironic as it may be that he can't swim). 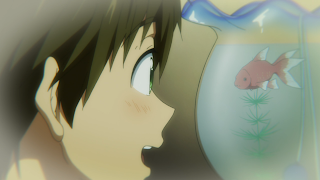 Although I'm most confused why Makoto is supposed to be an enemy of Rin and Haru, KyoAni you dropped the ball there! Well, it does if you're aquasexual like Haruka! Ever seen Gaki no Tsukai and its batsu(punishment) games? I especially like the yearly No Laughing specials. Well, killer whales are notable for being highly social... They travel in groups. 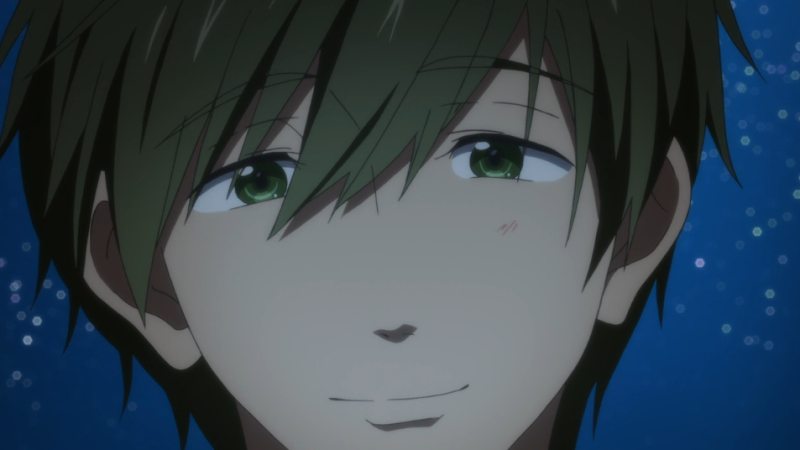 If you consider this episode's message it does fit Makoto very well. Apparently his swimming (as described in the LN) is rather forceful... and he doesn't know how to hold back. Ah, that makes more sense if that was what they were going for. Thanks! I'm going to view the rest of this season as the afterlife, since they clearly all died that night. Seriously, they went in one after the other to save each other and miraculously ended up on the same island? Nah, they definitely died and went to swimming heaven. Also, about the killer whale,the Orca: did you know it's not a whale? It's a dolphin. 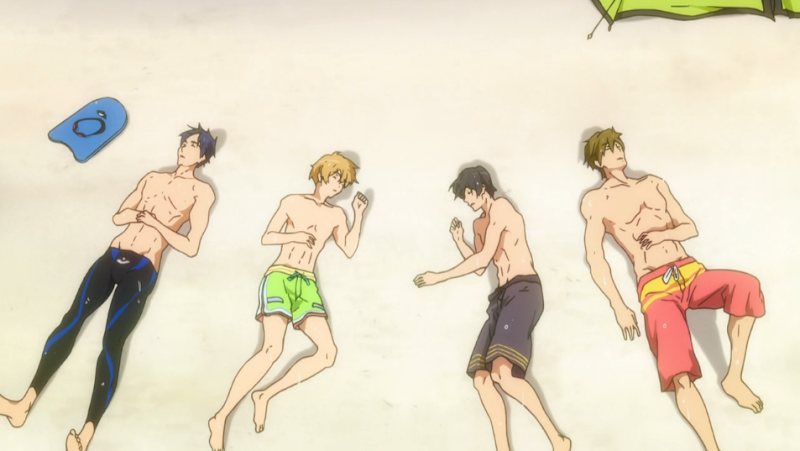 Sooo Haru's and Mako's animals are close in relational. They are a lot like dolphins, the orcas, social and curious. The reason they're called killer whales, is because they are in the top of the sea-food chain. They hunt everything from huge whales, to seals resting on ice-floats (they will create a wave to get the seal down in the water, it is quite amazing to see), to deadly sting rays and even sharks. Yes, I did know that. It was the "top of the food chain" thing that had me confused about what it had to do with Makoto. I didn't think about the "close relation" thing, though. This is making a lot more sense now! I love this anime, I really like the characters. I also kind of viewed the killer whale to represent a "Gentle Giant," despite being on the top of the food chain and the incident at Sea World. Makoto is a gentle giant in how he acts kindly and motherly towards others and since he's a big kid. 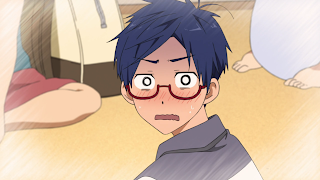 Confirmed: He's 6'0"— two inches taller than Rei and three inches taller than Haruka. That does fit him very well! This just in— a quote from High Speed! (the novels that Free! 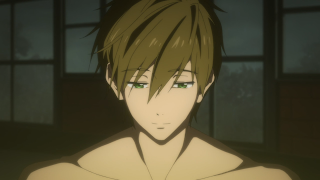 was based off of): "Unlike Haruka, [Makoto] forced his way through the water with an almost violent stroke and a thrashing kick. He was like an orca ferociously pursuing its prey." By the way, I love your blog. Stay awesome. Ah, I completely forgot about that line! Yes, that image fits him very well. Yeah, it still doesn't completely work for me either. I agree with the reasoning below, but overall it still doesn't seem to fit him.